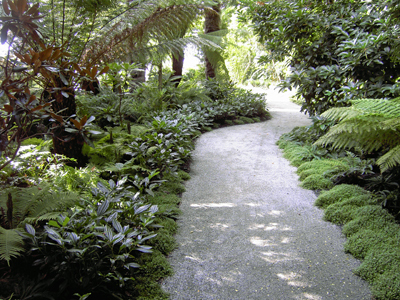 WALKWAYS and GARDEN PATHS: Gravel makes a great walkway surface, expecially for quiet secluded paths. 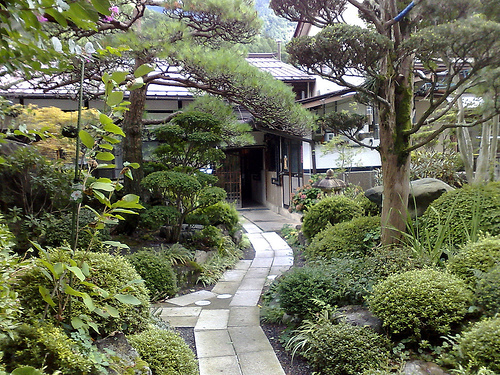 WALKWAYS and GARDEN PATHS: Curves make almost any walkway more interesting. 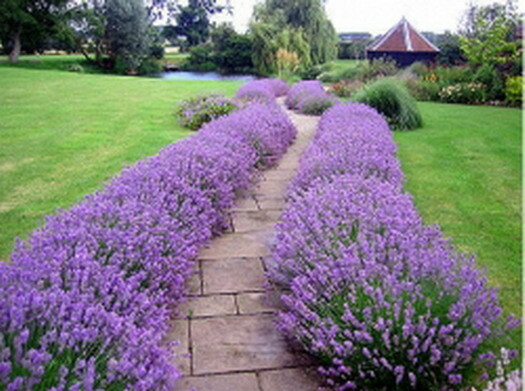 Make sure they compliment the shape of your landscape. WALKWAYS and GARDEN PATHS: This is a great formal entrance, but be sure your property is as grand before adding a walkway like this! 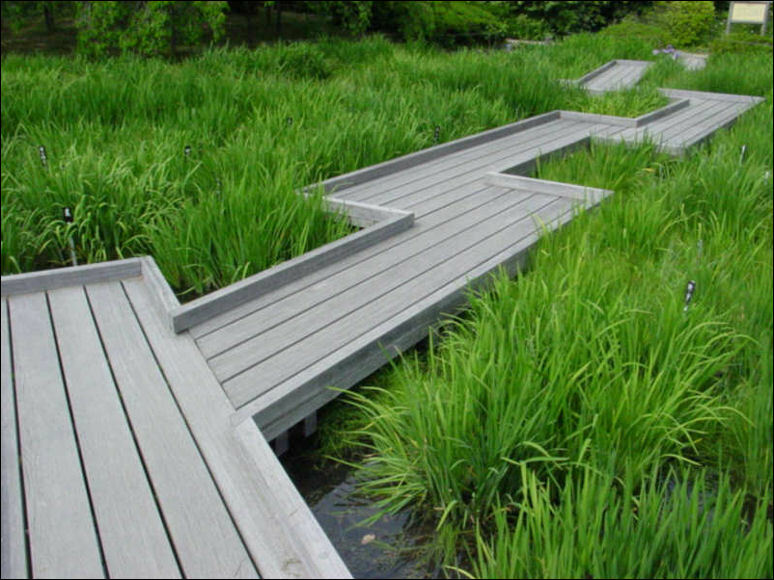 WALKWAYS and GARDEN PATHS: For wet areas, a raised wooden walkway works well. Use compsite decking material for the planking. It will last much longer than wood. WALKWAYS and GARDEN PATHS: It's all about the curves! 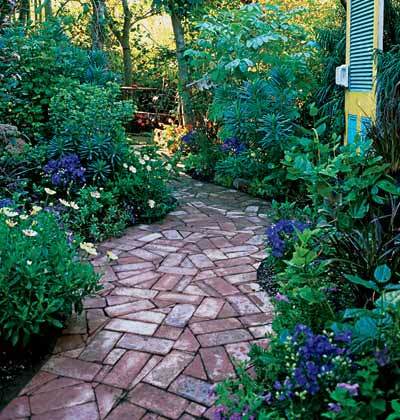 WALKWAYS and GARDEN PATHS: The placement of brick can determine the feel of the walkway. 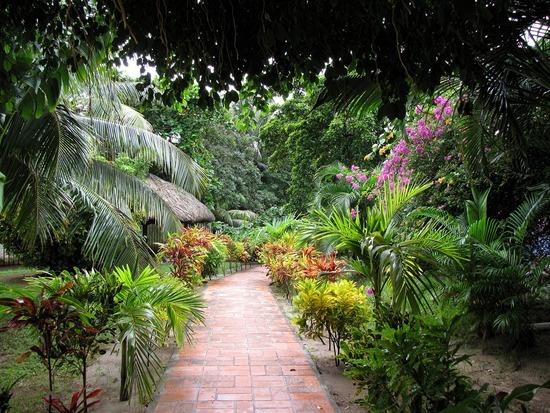 Walkways and paths are a part of almost any landscape, but they don’t always get the attention they deserve. 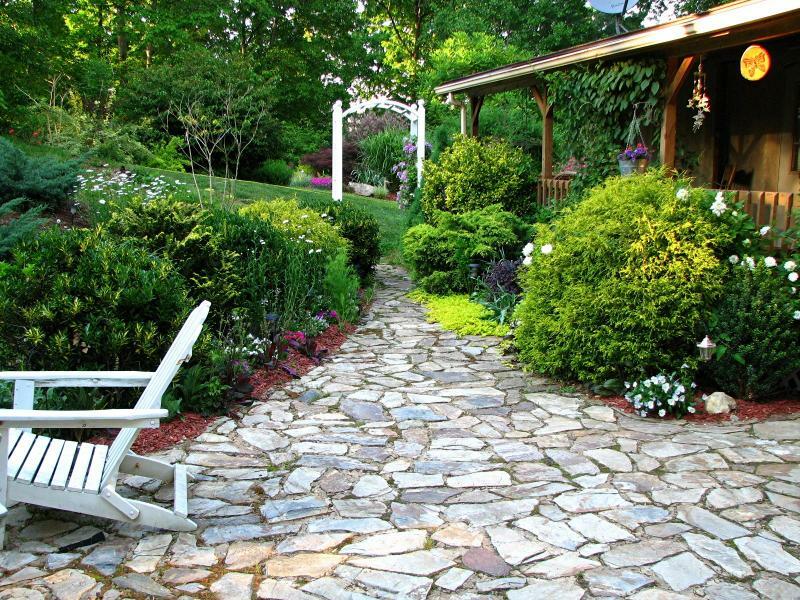 The way a walkway is designed can have a major impact on your landscape. 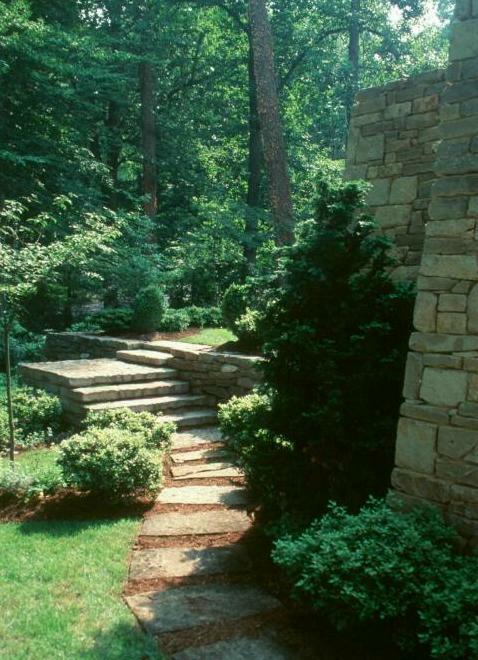 If you need to design a walkway or path, take some time to understand your options. Let’s start by taking a look at what walkways are all about. surface) of a walkway can provide a valuable contrast in the landscape. Garden paths can also be used to introduce curves and draw the eye to parts of a garden that might otherwise go unnoticed. As always, you need to define a goal for your walkway. Is the purpose of your walkway just to protect the grass from being trampled? 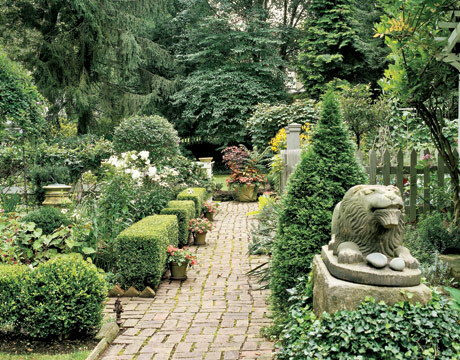 Will it add aesthetic value to your yard? Will it have any other purpose? Ask yourself these questions before going forward. Don’t underestimate the impact of a well-designed walkway. 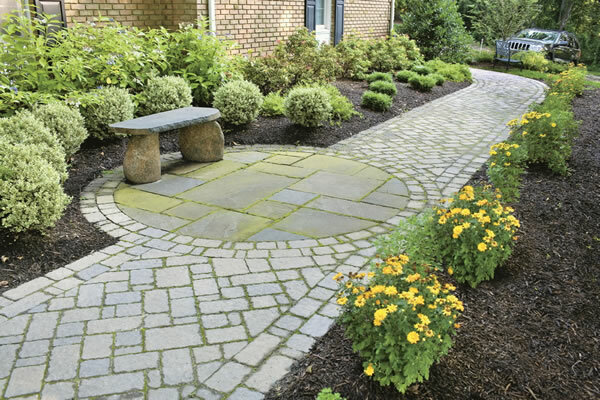 Most homeowners don’t put enough thought into paths and walkways and they miss a great opportunity to enhance their landscape. 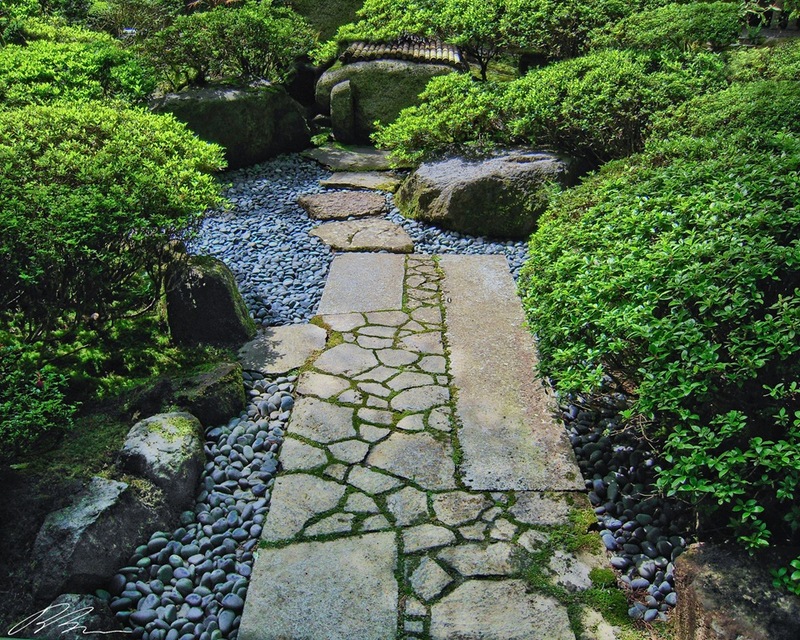 Be aware of the spaces you are creating with your walkway. 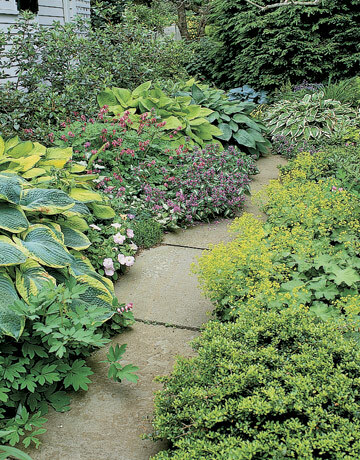 A walkway will divide your yard in some way. Make sure you don’t create awkward spaces with this division. Keep your goal in mind. 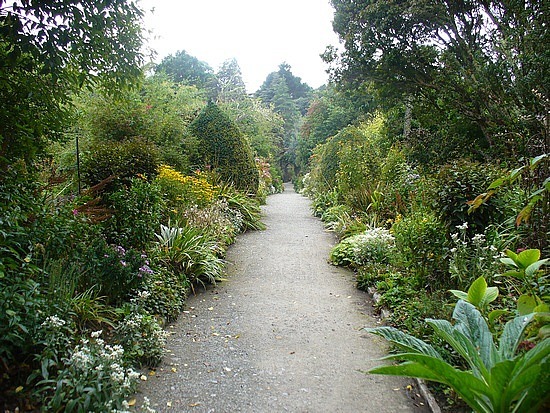 High traffic walkways should be wider and more direct than garden paths. No one wants to carry groceries down a garden path! Scenic paths can be thinner and more winding. They should show off their surroundings. If you live in a climate with a cold winter, think of how your walkway will fare in the snow and icy conditions. 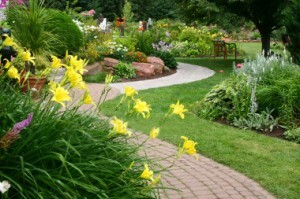 Make sure your path compliments your landscape and home design. 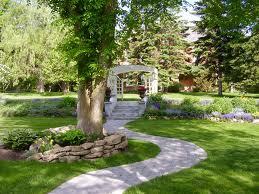 The lines of your walkway should reflect the lines present in the rest of your landscape. If you’re not sure what’s best, it’s usually safe to go with shallow sweeping curves. Steer clear of straight lines or dramatic curves unless you’re sure they’ll fit into your landscape. 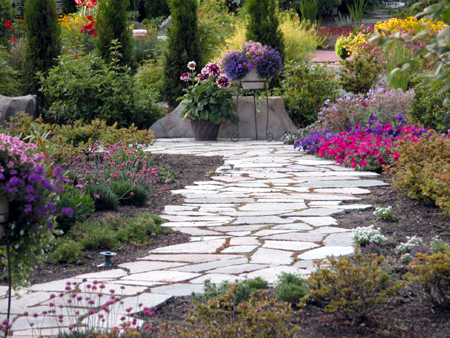 Try laying out your walkway several different ways and see which way feels best. Once you’ve got it down, mark both edges with marking paint and live with it for a few days. This will give you a chance to see how it works. Most homeowners decide to put in a walkway because they need to replace an existing one, or they need access to a specific part of their yard. 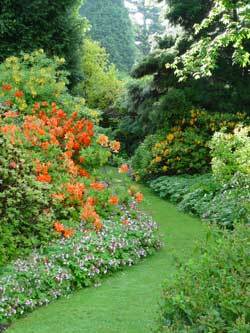 If you have a large garden, you could consider adding a path or walkway to add interest and contrast. Walkways draw people into a garden and make a great focal point even if they are never used. 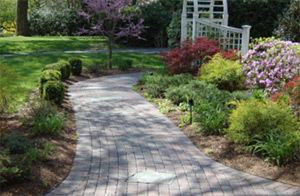 There are several different materials to choose from when designing a walkway or path. For main entrance and very high traffic walkways, use firm, subtle materials. 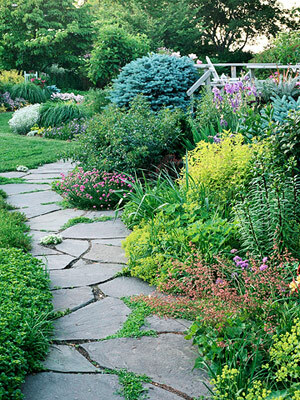 Materials like loose gravel and whimsical designs work well for garden paths, but don’t usually work for main entranceways. 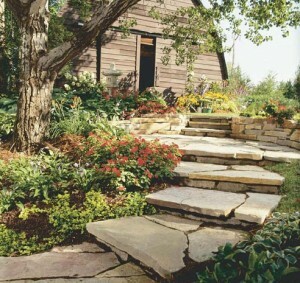 Here are some of the basic materials to choose from, but you can use almost any hardscape material to make a walkway. 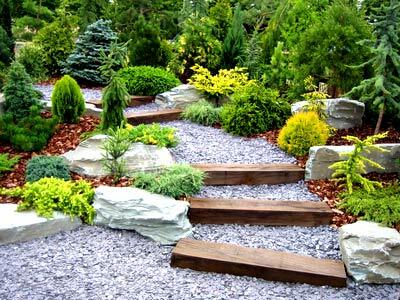 Crushed stone, pea stone or similar aggregate stone materials are probably the cheapest way to get a landscaping surface into your yard. The installation is easy, even for an inexperienced homeowner and the materials are inexpensive (with the exception of some exotic stone materials). It gives a very rustic look that fits well into casual designs. To install it, you just need to remove 5 or more inches of dirt from the area , lay down landscape fabric and then back fill it with the stone. You can create a walkway in one day. 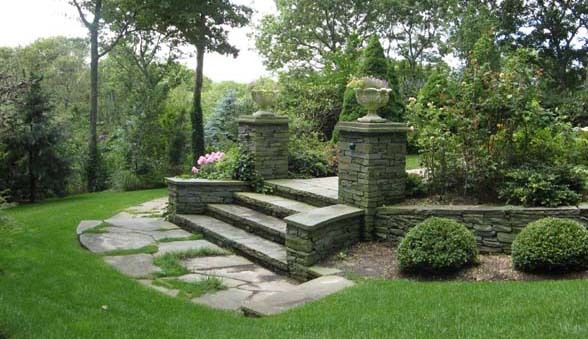 If your walkway abuts a lawn, you may want to use some sort of edging between the stone area and the lawn. that can grow through the stone (landscape fabric underneath will help, but not completely eliminate this problem). It’s also a little difficult to shovel snow or rake leaves off of this type of surface. Pea stone can be a great low cost surface for a rustic walkway, but make sure you’re willing to pull a few weeds if you want to use this material. 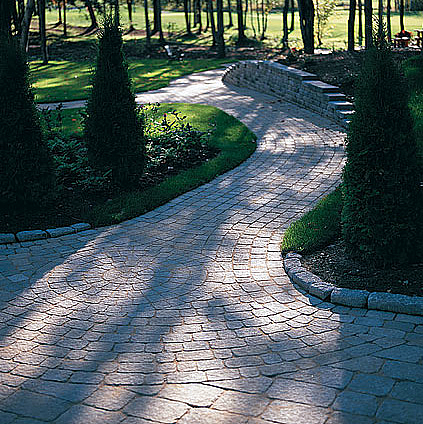 Pavers are a great all around patio surface for walkways (and patios too). They come in a wide variety of shapes, sizes and colors. 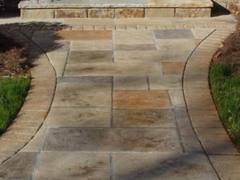 Pavers are more expensive than pea stone, but they last longer and give a more formal appearance. Pavers are difficult to install if you are inexperienced, but with some training it’s possible for a homeowner to install pavers successfully. The major benefit of pavers is the fine, smooth, finished look they give. 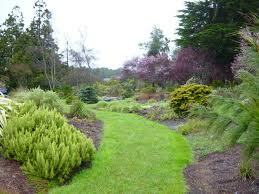 The major drawbacks are the high cost and the possibility of weeds growing in gaps. 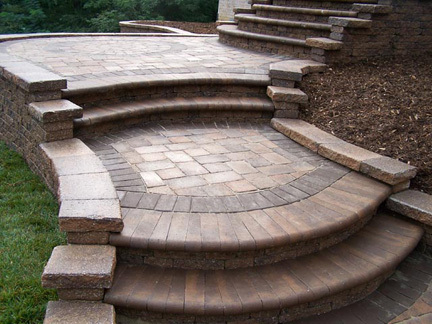 Some homeowners also feel that pavers give an artificial look to outdoor surfaces. This really depends on the design and mood you are trying to create. Each year, better and more natural looking pavers are being created, so make sure you take a good look around before you make a decision. If you are installing pavers, we suggest using polymeric sand to fill in the spaces between pavers. 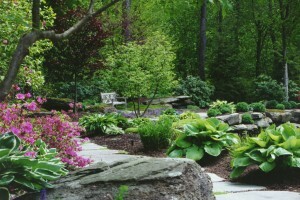 Polymeric sand forms a tight bond when water is added that helps block weed growth. Stamped concrete can give the look (almost) of natural stone, but is much faster to install and does not leave room for weeds to grow between stones. It’s about the same price per square foot as pavers (depending on the paver you choose), but it’s much more flexible. You can create very natural looking or more formal looking designs by simply using different patterns. Installation can only be done by professionals with the proper equipment. The major benefits are the flexibility of the style, the speed of install and the cost compared to natural stone. The only real drawbacks are the cost when compared to gravel or pea stone and the possibility of cracking over time. 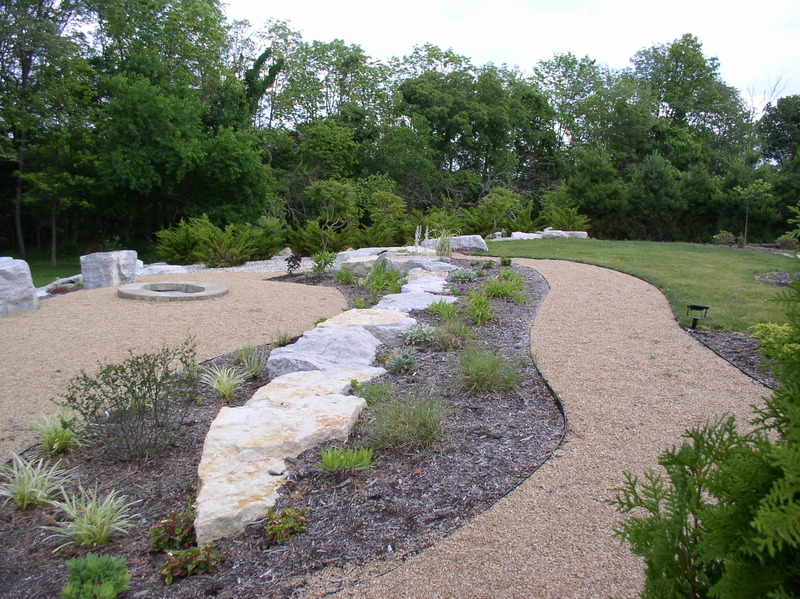 Natural stone is usually considered the most desirable of all landscape surfaces. It’s hard to beat the beauty of natural stone. You can find stone to match almost any mood you’re trying to create. 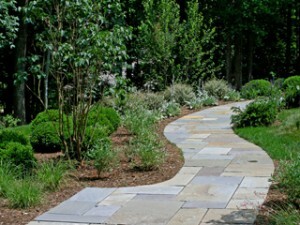 If you want your walkway or garden path to feel like it’s part of the landscape, then natural stone is your best choice. Unfortunately, it’s one of the most expensive surfaces to install. The major benefits of natural stone are it’s beauty and natural look. The drawbacks are primarily the high cost, weeds that may grow between stones and the shifting of stones that can happen over time creating uneven surfaces. Like pavers, natural stone is not easy to install if you have no experience, but with a little training (and a lot of sweat), it can be done by homeowners willing to put in the effort. 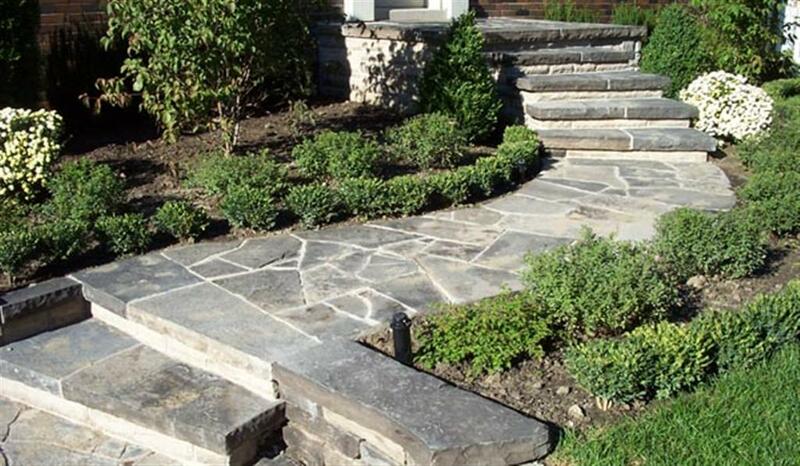 If you are installing a natural stone walkway, we suggest using polymeric sand to fill in the spaces between stones. As with pavers, this will help keep down weeds. 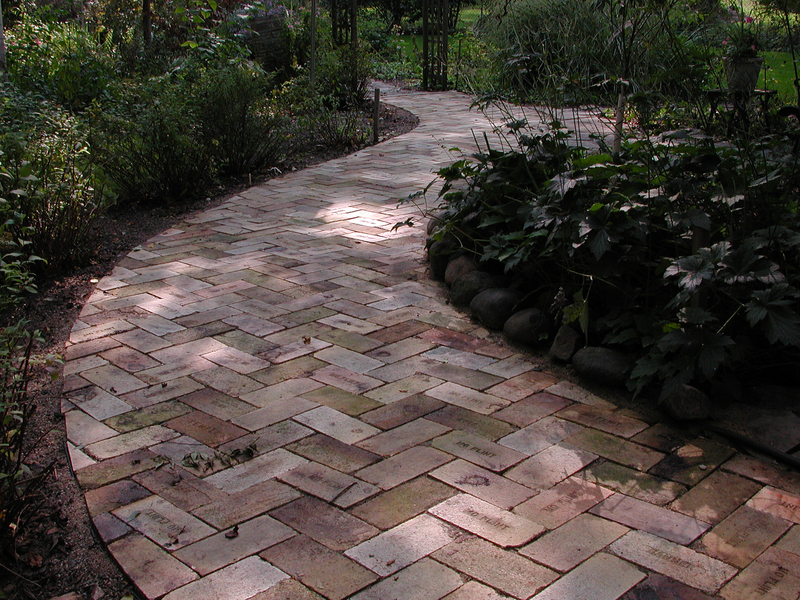 Brick is another relatively inexpensive material for walkways and paths. Depending on the pattern, bricks can create anything from a formal look to the most whimsical. Don’t feel restricted to the typical boring bricklaying patterns. They are a little easier to install than pavers because of their size, and usually less expensive. Bricks share all of the other benefits and drawbacks as pavers, including weeds growing in the joints. 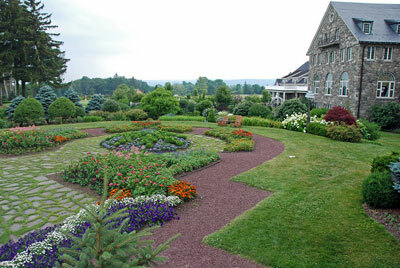 As with pavers, polymeric sand will help reduce weed growth. Once you’ve chosen your material and pattern, you’re ready to install. Take time to decide on your material pattern, it will make a big difference in the look of your walkway. Another trick to designing pathways is to use the edges of your surface to make a statement. If you want to create a formal look, give your walkway crisp edges (or maybe a border in your pattern) and leave the edges exposed. If you want to create a lush, more romantic look, plant along your path and let the plants cover the edges of your walkway. 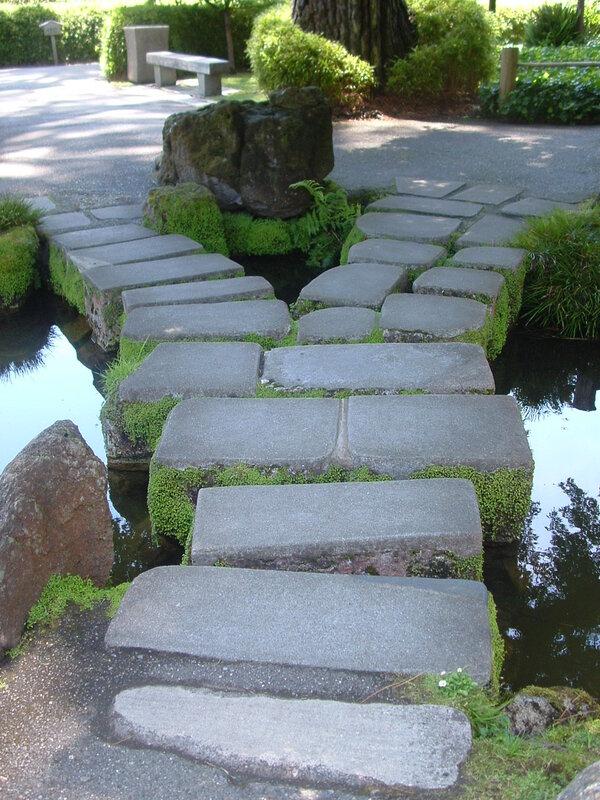 This gives the impression of the walkway “floating” through the landscape. Be sure to check out our slideshow of walkway designs before making any decisions and happy designing!